according to Thich Nhat Hanh, attention reminds my mind that I have a body. Attention is mindfulness: peace, joy, & concentration. Pay attention to your breathing or to drinking a cup of tea. Smile, drink tea, find joy. source: Shambala Sun, Jan 2016, p. 57.
is it OK to send distance Reiki when I have a cold? not a trick question. Not a joke. Always wondered. 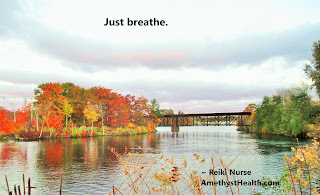 I hesitate to send Reiki if I'm sick or feel off-center; I like to be my best self when I share Reiki with others. That's one reason Reiki inspires me to be as healthy as I can be. I want to be my healthiest best self because I believe I'm part of this process of sharing Reiki. I believe that as a nurse, and a Reiki practitioner, I interact energetically with my clients. I don't see myself as merely a pipe or a vessel. My attention alters the energy. I interact with the energy and with my clients. Or do you believe that sharing Reiki is a passive process? Sure, I step back, take my ego out. Get into the flow. Relax and just be. Detach from the outcome. Check, got it, been there, done that. But then. Then I disappear? If my energy has nothing to do with Reiki, then why can't a student get attuned from a book or online? Isn't Reiki alchemy? The magic of connection and love, also known as universal life force energy; isn't my energy a small part of the magic? Or perhaps you believe that the practitioner is completely insignificant. Researchers know that observation alters the outcome. Just being there changes the situation. Attention affects results: the Hawthorne effect, the observer effect. Can we generalize this to Reiki? When I get a psychic reading, I know that the information is filtered through the medium's life experiences and education. The medium interprets visions through the context of her life. She uses her own language to express what she sees and knows. The information comes through, but is altered by the medium, the channel. When I'm on the table at a Share, I can discern differences in energy of the various practitioners. I can feel energy. Your energy feels different from hers, from hers, from his. Yet everyone is sharing Reiki. So if it's passive, if we're pipes, individually insignificant, and we're all sharing Reiki, why does one person's energy feel different from another's? Anyway. When I send, I like to send from my best self. That's why I eat nutritious food, sleep well, and exercise. That's why I meditate, do self-Reiki, and practice yoga. That's why I work on my social relationships. I want to be healthy. I want to send from my peaceful centered self. Same with sharing, or hands-on. I want to be my best healthiest self, a clear channel for Reiki. A therapeutic presence for another person. Reiki does no harm. So I'm sure it will not harm anyone if I send when I have a cold. I don't imagine that I'm sending germs, or giving someone an etheric virus. So this is the part that confuses me. I hesitate to send when I'm ill. Why? Not sure. Trying to figure it out. Why the hesitation? I wonder if I should send if it's not my best. I worry that I'll somehow knock an ion off it's axis or something weirdly quantum like that, even though just for today I will not worry. And a little Reiki is better than no Reiki. Still, that one wonky ion. I worry that if it's not my best then it's not good enough. I imagine that if I'm sick I'll warp the energy. I worry too much, obviously. And ask too many questions. I did a quick poll among other practitioners and no one else seems to feel the way I do. Outlier. Principles are the foundation of Reiki: living the principles facilitates connection to source, is a path to enlightenment. Hands-on (with others) is a blissful merging into the flow, sharing the experience of the energy, and hopefully an inducement to others to become students of Reiki. Respect all living things; everything is alive. These are the principles, as rewritten by some of my students. I love this update. Respect all living things; everything is alive. Be grateful. where butterflies are all gone brown with wheat dust. and hurtles into the sun. Laryngitis x 4 days. I can whisper, but when I try to speak I squeak and wheeze. I sound like Chewbacca. How can I order home heating oil? Go grocery or Christmas shopping? Volunteer at the cancer center? Go to holiday parties? I can't do any of those things. I can't speak. Oh, and I have all the usual cold symptoms too: coughing, sneezing, sinus stuff. Usual life is cancelled or postponed. I'm stuck at home. I did a 1000 piece puzzle, read the Elena Ferrante Neapolitan novel series (4 books), mended a dress, spun alpaca fleece, read spiritual articles, wrapped Christmas presents, ordered presents online, watched a movie, and cleaned. I rested. I drank fluids continually: water and herbal tea. I took ibuprofen, echinacea, and elderberry. As good as Silver Lining Playbook, the movie, is; I like the book even more. Watched it, read it. Did laundry, wrote Christmas cards, listened to the radio. Tomorrow I will drink water and herbal tea. I'll read a book, spin, and rest. I'll try to speak. Maybe tomorrow I'll sound like C-3PO. My grandson likes to converse. He's 1.75 years old. We were hanging out, just talking. He doesn't have an abundance of words, speakwise, but he understands a lot. I started to tell him about the endocrine system. He stuck a foot in my lap and wiggled his toes, wanting "This little piggy went to market..." instead. It was her idea, so of course he went along with it. He loves her. 16 of them. The chicks, multicolored balls of down, had their own room and a light bulb for heat. No dogs allowed. I feel like I was there, I remember seeing them, but when would that have been? Perhaps it was photos and descriptions. They grew up. He named them all, calls them his girls, his ladies. Built a coop and moved them outside. Tends them. They come running when they see him, greet him when he gets home from work. Sometimes one extremely strong adventurous lady flies out, but can't get herself back in. She runs to him and he lifts and drops her back home. The first eggs were gelatinous. The next ones had shells, but were tiny. Now the ladies lay big fine eggs. Mostly brown shells, some green. Sometimes I buy them lunch: my excellent friends, not the ladies. I buy lunch and my friends bring me extra eggs and we don't keep track of who owes who but I'm pretty sure I'm luckiest. Have you seen that popular YouTube video, Resting B Face? Or maybe it's B Resting Face. Anyway. I show it to nursing students every year. Tell them part of being a great nurse is being able to communicate compassion. Tell them if they have RBF they can overcome it with learned behaviors. Noticed a trend this semester. Identified an association. Realized that most of these young women with RBF have been medicated since childhood, medicated for ADD, ADHD, or depression. Now they have flat affects, expressionless outside, but highly sensitive inside. Interesting, right? Went for a trim. You know, for the hair on my head. Take off an inch. Keep the same style, or not, I don't really care and I leave that to the professionals. She came at me with a hot metal tool. I cringed. "Ceramic," she sternly informed me. She disapproved of my hair: parted in the middle, curving in on one side and fluffing out on the other. So she straightened it, pulled it, burned it, flattened it, cut it. Voila. It did look good. Sleek, sharp, blunt, straight, chic. It won't ever look like that again, unfortunately, as I'm more of a wash & done kind of person. It did look good. see people's energy? I do sometimes. See, hear, and feel it. One person I know has loud jangling sharp yellow and brown cacophonous energy. All odd angles and sharp edges. 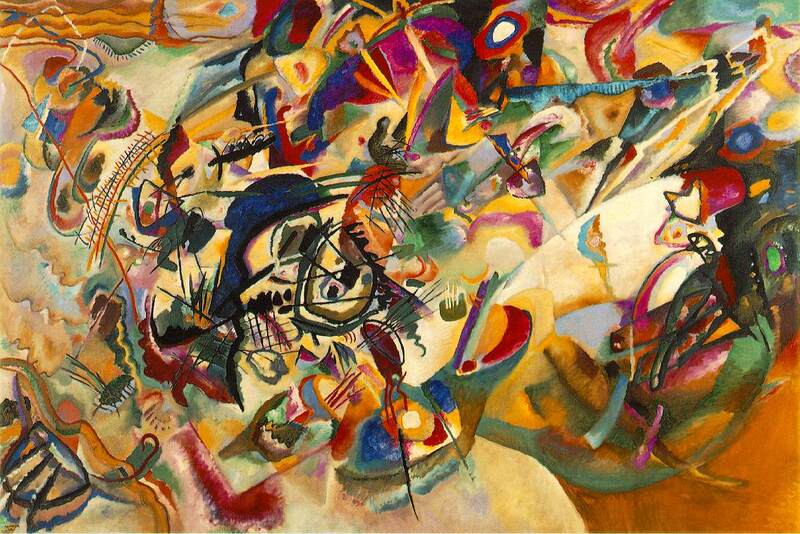 Overpowering, like a Kandinsky painting. I can't hear when she's near. Some have warm heart energy: slow, peaceful, accepting, listening, & loving. They sing Earth songs and listen to the wind. Spending time in their energy is like being in a garden where flowers grow and bloom. Monet. I went happily to a work holiday party. I had my gift and my grapes: a modest gift to swap and grapes for the potluck. I had a special beautiful hand-made plate. Grapes are easy: just wash and arrange. It's what I bring when I can't find the time for something more elaborate. Thanksgiving I made three pumpkin cheesecakes and one pumpkin pie in a chocolate crust. Took me days to make them. I roasted a sugar pumpkin and a buttercup squash. Cooled, pureed, mixed, baked, cooled. I didn't have days. I usually work 50+ hours/week. I brought grapes. Unfortunately not organic. Arrived. The door was locked. Huh? I waited, called, no answer. Finally someone came to open the door. She seemed harried. Arrived at the lobby. People rushed by and glanced, making quick shallow smiles. People seemed busy. I wandered to the kitchen to wash and arrange the grapes. Set down my bags and coat. There were many people in the kitchen: stirring, setting out food and plates. No one spoke to me. I went to the sink to wash the grapes and heard someone say, "Well I would if she'd get out of the way." I looked back and two people were staring at me. People seemed annoyed. "Why? Oh wait, I know, I feel it too. C'mon, let's go do some Reiki." Reiki time. Afterwards I felt washed and aired out in the sunshine. "You're an empath," she told me. All those people were stressed and you felt it. That's all. It's hard to be in crowds, and even harder when you feel their stress." Empath? Oh. I thought I was an anemone. But the main thing is the spiritual path, the quest for enlightenment. That's the primary reason for being Reiki. Sharing Reiki with others can be part of one's Reiki journey. Doesn't have to be. Can be. 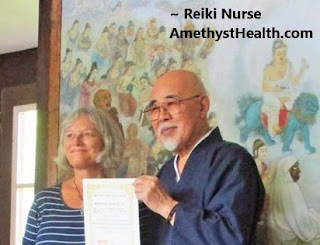 If you share Reiki with other people, and they love it, maybe they can learn Reiki. Be Reiki. So this whole thing about just plain Reiki and Reiki with other modalities. I love other modalities. I love sound, stones, messages, massage, incense, and laughter. When my Reiki friends and I get together we joyfully, creatively, and intuitively combine therapies. But we know what is Reiki and what is other stuff. We know the difference. We love and respect Reiki, but we like to play with sound and stones, etc. But when I introduce someone to Reiki, when I share Reiki with a person with cancer, when I teach students, and when I practice at medical institutions, it's just plain Reiki. Just plain Reiki is just plain amazing. It is enough. It's marvelous: relaxing, restful, and rejuvenating. Why? Because I don't want to confuse people. If I'm teaching or introducing a person to Reiki, then it's just Reiki and get my ego out of the way. I want the person to experience Reiki; the experience belongs to the person. It shouldn't be about me. It's about the person, what the person feels and knows. My experience is irrelevant. I'm the supporting actor, or the silent woman in the crowd, and the person on the table is the star. That's why. If I'm to be a therapeutic presence, then I must keep my ego out of it. Keep it plain and simple. Let the person feel and be in Reiki. Shared Reiki for almost two hours today, in a Reiki tent, at an agricultural fair. I met lots of people. It was nice to connect, to step out of the intensity of the crowds, to be Reiki. One man on my table told me he had pancreatic cancer, with mets to his liver and colon. He had beautiful skin and appeared to be completely healthy. "Appearances are deceiving," he told me. It was his first Reiki session. I shared with his wife also. Felt so honored. Shared with another husband and wife; husband complained his wife doesn't Reiki him enough. Am I just being like one of those kids who won't eat supper if the carrots touch the potatoes? Just plain Reiki is just plain amazing. It's simple, subtle, sensational. I'm Unitarian or Zen: I don't talk a lot; I listen. I don't waste motion: I don't shake, tremble, or dance. I just place my hands and it's Reiki. Some people like the drama; they want the practitioner to perform. The other thing different about me: I don't discuss my experience with my client. One woman asked me what I saw and felt. "Let's keep this about you," I responded. "What did you see and feel?" She happily described her experience to me. It was good. Taught suctioning all day. Eight 50-minute sessions. Oral and tracheal suctioning, sputum specimen collection, and applying sterile gloves. Lubricate the tubing, insert into the tracheostomy, twirl and apply suction as you withdraw the tubing. You have 15 seconds. Allow the patient to rest for at least 30 seconds, applying oxygen if needed. You may reinsert twice. Tomorrow is cardiac landmarks: all pigs eat too much. I don't understand how garden critters can munch on the hot peppers. They're tiny but so hot. They're called firecrackers, are tiny and pointed, red orange and purple. Almost every one shows a teeny bite. Who? I can tell because the coconut salt scrub in the shower, deliquescent, liquid for three months, is now solid. after teaching for 7 hours I went to the cancer center to share Reiki with people with cancer. I placed my hands. Conversations of the day filled my head. I saw the words swirl around around, up and out; I felt peace. I went to the beach yesterday, a small sandy beach with a correspondingly modest parking lot. It was warm and sunny but breezy. I finished the James Salter novel, Light Years. It's excellent. I got it used, online, for about $3. Was surprised when it arrived to find it signed by the author. I was reading at the beach, absorbed in book, laughing children, and waves of fog. I heard music. Live guitar. I scanned the beach and boats, looking for the musician. Saw a crowd of standing figures, gray and unmoving, on a rocky ridge, sheathed in fog. Rows of white chairs, empty. Three musicians. Classical guitar. A bride in a strapless white dress, surrounded by people in gowns and suits. A bus arrived and guests walked to the chairs, women in cotton dresses and men in wrinkled tan suits. A chuppah flapped in the breeze. A second bride walked past the musicians, to the very end of the rocky point, and stood under the chuppah. The sun shone through her veil. The first bride stood a ways away, watching. Two brides? Another bus arrived and tall slim women in silk turquoise and stilettos strode off the bus, followed by young men in grey suits. Two brides, two weddings, on a late summer day at the beach. I heard a story on the radio about a boy and his father; they had no language in common and thus felt estranged. Immigrants, the parents decided their son should learn English, but the father never did. They never spoke. Just awkward smiles and gestures; loneliness, sadness, and guilt. Something clanged in me as I listened. Two people might share the same words yet fail to communicate. Went to a Reiki retreat on Saturday. We did a heart sutra meditation. I sensed a presence and wondered who it was. I opened my eyes to look and saw no one. I closed them again and felt the presence. I saw six young men in flannel shirts and overalls, standing in a semicircle, glaring at us. I opened my eyes and looked at the other women, to see if any of them sensed or saw the men. Everyone looked relaxed. I closed my eyes and saw the men; I sent love to them and they disappeared. They reappeared. I sent love again; they disappeared and stayed gone. The leader asked us to look deeply into our hearts; she asked us what our hearts looked like. I instantly got a vision of a parlor in a farmhouse in Kansas. Pink upholstered sofas and chairs, big soft things, Victorian furniture and furnishings. Lamps with hanging crystals. Is that Victorian or deco? The farmhouse was surrounded by golden fields of wheat. My heart is a pink Victorian parlor in a farmhouse in Kansas. We did Reiju: attunements. Martha and I practiced the method we learned from Inamoto Hyakuten Sensei. We asked for orbs, and several of us took photos. As we were performing the Reiju, Martha looked up and gasped: a sundog. A rainbow halo around the sun. A couple of people reclined on the grass to look and take photos. They saw dots of light moving around the sun. They took photos and a video, and captured the orbs. They were colored, and had tails of color. Then we did Reiki. We set up a table outside on the lawn, in the shade. The temperature, humidity, and breeze were perfect in the shade. Talked with a friend yesterday. He doesn't love his job, and he's always loved his jobs, bosses, and coworkers. Now he doesn't. He plans to work there for a year so he doesn't have to pay back his moving bonus, but then look for something better. He figured out that he doesn't care what kind of company, but he wants a boss with brains and vision, coworkers who work hard because they love their jobs, and a place where you work for a mutual goal, not just busy work. shared Reiki with people with cancer yesterday, so lucky: doing it again today. Sensei's teachings keep popping into my mind. When I say lucky, I mean me, for being Reiki. I don't mean to diminish the struggle and pain expressed by the clients. Yesterday there were tears. People were grieving, were experiencing pain, were struggling with the side effects of chemotherapy and radiation. I hope our clients found some relief with Reiki. I hope they felt balanced after their sessions. I hope they experienced insight, had less pain and stress, and felt happier. That I get to be part of this, part of someone's health experience, part of someone's life- I feel lucky. Evidently there will be cookies. Not placed by me, but by the host or server or some large nebulous entity. I hope you'll continue to read. Thank you. Floating logs, half submerged, in the bay. I sat on a granite boulder and looked at the blue water. Sun was hot on my shoulders but the breeze was cool and damp. The logs moved. A square head poked up. A spotted gray arch rose wetly and disappeared. And the other. I watched the seals for half an hour. The earth is flat and there's a giant waterfall at the edge of the ocean. At least that's how it seemed today. I sat at the beach, the Atlantic Ocean. There was a flat hard line of dark blue where the water ended, white sky above. A sailboat there, sail like air, boat invisible in the water. A long lonely stretch of dark blue, one boat. I recently spent 20 hours in class. As a student. I learned a lot. First was 12 hours, split in three sessions, on communication and self-care. These are topics I teach to nursing and Reiki students. The delivery was verbose PowerPoint slides; two instructors read the slides to us for 10 of the 12 hours. Second was an 8-hour class on laboratory values. The delivery was verbose PowerPoint slides; the instructor read the slides to us for 8 hours. All the instructors were smart, skilled, compassionate, and experienced. They had a plethora of important information in their heads and hearts. But. Their delivery was at either end of a super-cute-adore-me and monotone continuum. They read PP slides to us. They cut off audience questions and comments, saying "I have a lot of content to cover." They ignored, alienated their audience, who were also smart, skilled, compassionate, and experienced. Their content delivery method assaulted and insulted the learners. There were ten students at the lab class: 5 RNs, 3 NPs, and 2 physicians. The NPs were: 2 nurse midwives and one pedi-psych NP. The RNs were 1 ICU RN from Colorado who was able to share a few fascinating facts about high-altitude care (before being shut down by instructor), 3 hospital nurses, and me. The lab class instructor read PP slides to us. She listed common lab tests and read to us how to remember normal values, and a few facts about the tests. Why do I need to remember the normal values? I don't. They are listed alongside the found value on computer screens. One no longer needs to memorize normal values. One will memorize them anyway if used daily. Why spend my valuable time telling me how to memorize? I learned that I already know facts about the lab tests. This is what I wanted to do in this class. I wanted to get into small groups with the other incredible students and do case studies. Give me a list of a patient's lab values and let us interpret, form a picture. Interact with others. Instead I sat in a room with 9 intelligent and experienced healthcare professionals and never spoke to them. Never learned from them. The communication/self-care class: best part was role-playing. That was interactive and engaging. We all woke up for that. Adult education: engage the learner. I love to teach Reiki to a person with cancer. I want the person to see that he/she has dignity and worth ~ has something to give back, something of value to share with others. Education is the key to unlock the cage of poverty. Unlock the jails. We must support schools, teachers, and educational systems. Exciting and beautiful educational opportunities must be available to all, not just a select few. Put money in schools, not jails. This nursing diagnosis was established in 1994, but has been controversial. NANDA is considering retiring this diagnosis. 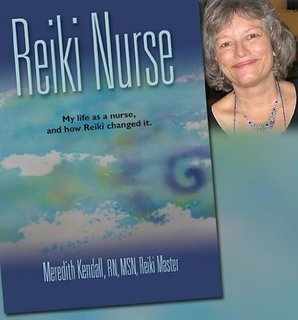 It relates to holistic nursing and Reiki. How unfortunate if it is no longer accepted. Some Reiki researchers are researchers, but not Reiki practitioners. So there might be an inherent lack of understanding or even promulgation of Reiki myths in published studies. When sharing Reiki with another, therapeutic presence is an important part of the experience. The practitioner must be able to communicate compassion, model ethical behavior, and demonstrate knowledge of Reiki history and practice. All of this can be silent, unspoken unless required by the client. But since Reiki is so difficult to define, how to do we know what to measure? Quantitative Reiki research is all about finding the right question, the right hypothesis. Now qualitative, the person's lived experience. Yes, let's hear about that. Raspberries are piling up in the freezer. Picked twice yesterday, and another 3 quarts this morning. Tons of cilantro, basil, and mesclun. Can't keep up with it. Picked the first green beans today. Steamed them, and ate with pesto. So tender, such sweet mild flavor. Some delicious blueberries, more every year. The birds like to fly in under the netting for bites. I don't mind sharing a few. Sunflowers must be 10 feet high. Cosmos, calendula, bee balm. Love the fairy energy in the garden, gentle touches of welcome. I love teaching; I love seeing students think, reflect, create, synthesize, discern, overcome fear, and evolve. I realized I see pictures in my head. My friend Bets and I are getting older, aren't we all, and anyway sometimes I forget a word. Sometimes she forgets a word. I noticed that when we're talking and she's trying to think of a word I get a picture of an object in my head. The object; the thing she's trying to think of. Well I didn't get that new phone. Got off the Edge, back back back to safety. Still have my laughable-to-some ancient 4-year-old phone. It works just fine. The problem was a simple billing glitch. Fixed with a phone call, bonus $10 credit for my trouble. Back home, back to work. No carbon monoxide alarms, no kayak, no lake, no loons. Plenty of students to engage, papers to grade, and miles to go. Monday I taught Reiki at the University, all day. We did attunements beside a froggy pond. Turtles too. Monday evening was a four-hour compassion inservice. We had Italian sandwiches and sweet gooey pumpkin roll. We did empathy role-playing: how to encourage dialogue and be comfortable with difficult topics. Tuesday the contractor didn't come to measure windows. I need new windows. The windows are falling apart, painted shut but paradoxically drafty. I spread 6 bales of hay around the garden in the morning and went into the office at noon. Worked til supper: salad from the garden. Sat outside and read in the evening. Yesterday and today I started work at 5:30 am, worked 12 hours with students at the hospital. We administered medications: intravenous fluids and narcotics, antiemetics, antibiotics, laxatives, and vitamins. After work yesterday I went to a planning meeting for an annual fundraiser. We met on a patio outside a big house on the lake. There was pizza, beer, salad, and eclairs. There were reports on progress. Chilly lake breezes after a warm day. Today I sat in the garden after work, graded papers as the sun set. I picked raspberries, admired flowers, drew flowers on the students' papers, and watched the sky as pink and orange streaks developed and faded. Tomorrow is a day of meetings, interviews, and curriculum planning. I hope to have time to work on student evaluations, grade Reiki posts for my online class, and analyze my Reiki research. I miss the loons, lake, kayak, and laziness. At camp, out to camp, upta camp. I'm staying in a cottage on a small lake in Maine. Yesterday was rainy. So I got up early and set off to do laundry. Check. Went to a Sprint store to see why my mobile hot spot device, an Android phone, was not working. I'd tried everything I could think of to get it to work. Nothing. So the store. In a mostly deserted mall. A family came in while I was there. Large, loud, inquisitive people with big sweatshirts bearing nationalistic gun and flag graphics. They bought phones. We were all there a long time. The clerks tried everything I'd tried and more. No success. Perhaps it's maintenance on the towers the clerk told me. Perhaps. The clerks laughed a little at my 4-year-old phone. So I asked them to sell me a new one. They did and I'll pick it up on Saturday. Android 6 Edge. I'll be living on the edge, hanging with U2, edgy and new. I got back to camp late afternoon. Still raining. Chilly. I turned on the gas heater, read, took a nap on the couch, read some more, spun some alpaca fleece, watched TV, did some self-Reiki and meditation. Read. Thought I'd go to bed early. By then it was toasty warm in the camp. Turned off the gas heater and heard a shrieking beep. Noticed a yellow light flashing on a wall-mounted electronic device. Burglar alarm? Can I just ignore that thing and go to bed? Probably not. I opened windows, turned on fans, emailed the camp owner, and looked up carbon monoxide FAQs online. The shriek was obnoxious, the online warnings dire. The owner emailed back that it prob just needed a new battery, sleep with a window open, that if it were truly carbon monoxide the beep would be very loud. Well, I could hear it from my car, parked up beside the road, so I guess that's loud enough. Eventually the beeping stopped and I went back inside. The yellow light had subsided. Safe to sleep. On vacation, bought a newspaper, looked at the weather map. I love weather maps. Nearly the entire US was red: temps in the 80s and up. The same temp way high in Alaska as in Tucson, Arizona. There was one little green oval: Maine, temps in 50s. There was a yellow circle around the green: temps in 60s. It shocked me to see all that red, and I'm grateful for our green, even though I'm at a lake. I don't mind the grey and rain, perfect weather for a good book. It's just, wow, all that red, and what goes along: tornadoes, floods, heatstroke, drought. Changes. 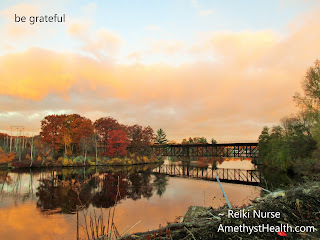 Reiki reflection papers were moving, insightful, considered, and enlightening. Students wrote that at the first class they were: scared, doubtful, and skeptical. By the last class they were feeling vibrations, feeling too relaxed to move, and seeing humans as energy. touch without touching, moved without moving, healed without pills, communication without speaking. Life is rough. Tough. Too much to do, too many people expecting too much, too much homework, scary tests, sick people who might die. This is what I hear from my students. They're stressed out, overwhelmed, freaking out, getting sick. Put your feet up. Get comfy. Close your eyes. Imagine you're floating up out of your body. Look down at that stressed self. Float higher. Float over to the beach. Think about how many drops of water there are in the ocean. Float back to your body. Eyes closed, wonder what you're supposed to learn from this situation. Life is rough? Good! Time to learn something. Look for a pattern. Make a change. Fresh cold local organic free-range gluten-free vegan spring water. My favorite beverage. any colder and we'll have to shovel this. It's June 1 in Maine, rainy and 47F (8.3C) outside, 62 inside. Cold. I turned on the oven so I can open the door every now and then and blast my face with heat. Sear my eyebrows. Scorch my cheeks. Roast my nose. We meet quarterly, a circle of healers, we heal each other. I drove nearly an hour, through forests, past farms and ponds. I brought ocean rocks for my friends, and a bowl of salad to share: greens from my garden mixed with rice and lentils, seasoned with garlic and lemon juice, topped with seared asparagus and cherry tomatoes. We took turns on the table. I saw us as circles of colored light. I couldn't feel my hands but I could feel our energy. We smudged with sage, sprayed a moldavite mist, made crystalline grids around the person on the table, played drums and rattles, and did hands-on energy healing. During my time on the table I saw myself as Fort Popham. I was a circle of living breathing stone. I was dandelion fluff blowing against the walls, the stone foundation, and the soft ocean waves. They said they saw and heard a cyclone of wind blowing through my chakras, one at a time. I felt the power of the other healers. I felt stardust, fairy sprinkles, floaty cosmic and grounding earth energy. Then we had lunch. Cold salads, because it's been so hot the past few days, but today is cold and rainy. 53 degrees F. I drove back home and am curled up in my warm wool shawl. It's morning, but dark as dusk outside. Expecting four days of rain and drizzle. Good gardening weather. I'll transplant seedlings into the garden: hot peppers, basil, and eggplant. I'll pull weeds. Wander and putter in the cool mist. Sit in the summerhouse and listen to the rain. Out back beyond the fence the swearing fighting couple moved out. A sweet young family moved in. They knocked on my door a few minutes ago; the young boy needed to retrieve his soccer ball. Out front, across the street, the old man died. Funeral last week. The widow stays, but doesn't come out much. Her kids check on her frequently. Kitty corner neighbors' trash blew all over the street on Tuesday. Greasy paper plates, Burger King and potato chip bags, and lots of plastic bags. Blew down the street, onto our lawns and driveways. The lilacs are going by. Every afternoon I hear lawn mowers. Why say "signage" when you can say "signs?" It's everywhere and everything. Not separate. Difficult to describe or measure. It's like love. Not like the color orange or a refrigerator. Went to a coastal state park today. I brought a murder mystery and New Age magazine and planned to spread out on a sunny rock and have a good read. I had my sun hat and reader sunglasses. Ready for sun and summer and a beach read. Waves, islands, and ospreys. Beach glass, shells, stones. Hikers, bird-watchers, tourists. The ranger met me at the gate with an 8 x 10 glossy printed warning with colored illustrations. She spoke to me for 10 minutes about the high population and dangers of the browntail moth caterpillar. They generate toxic fibers. Said she was extremely sensitive to them and was on restricted duty. She spit a little when she spoke. Said the caterpillars' fibers drift in the air and land on our skin; we breathe them in. Most people get a poison ivy-type rash, some experience trouble breathing, and a small percent go into anaphylaxis, (a hypersensitivity over-reaction of our immune system). She wore long gray pants; her tan long-sleeved ranger shirt was buttoned up to the neck. She had short coarse grey hair, stuck up from her head like the fuzz on a caterpillar. Said the risk will persist until July when they pupate, but that doesn't end the danger. It will take several good rainstorms to rinse the air and leaves. She shook a little. Keep your car windows closed, close your sunroof, if you have one. She inspected my car. No sunroof. Go home and shower. Wash your clothes in very sudsy water. She spit again when she said sudsy. Warned me not to linger under oak trees. Don't sit at picnic tables under oak trees. I looked up. We were in an oak forest. I parked under an oak tree and jogged to the rocky beach. High tide. No itch, could still breathe, no throat-tightening. Was surviving so far. I walked out on the rocks. No people around anywhere. Wonder why. Saw the famous osprey settling into her/his flat nest at the top of a tall tree, on a near island. Looked at the islands, at the patches of blue sky. Still no itch. Jogged back to my car. Feel it, be it, share it. Some feel heat, others coolness. Sometimes a tingling, almost an itch. Sometimes there's a great gathering and release of emotion. When I exercise I know I took care of my body, when I write a paper I know I took care of my mind. When I share Reiki I know I took care of my spirit. Where did it all come from ? Just a few weeks ago my backyard was a frozen Arctic wasteland. Spring happened, life exploded, and it's all color, noise, and biodiversity. There's a huge hot pink bouquet of blossom, commonly called crab-apple tree, and it's so full of buzzing bumblebees that I feel the buzzing and bumbling in my bones when I stand beneath the branches, which are loaded with bees and blossoms. The lilac is blooming too, keeping a hummingbird busy sipping nectar and hosting a home-building cardinal couple. The crab-apple, lilac, and cherry blossoms scent the backyard stronger than your mall soap shop. Also fragrantly blooming are lilies of the valley, narcissus, and creeping phlox. Less perfumey are violets, bleeding hearts, and dandelion. Meanwhile it's a cacophony, a jungle of sound, as birds ghetto-blast their songs: cardinals, robins, chickadees, sparrows, and nuthatches. I filled the birdbath and crab-apple petals drifted down onto the surface of the water, so they get a flower petal bath. Monkeys. It's gone from Arctic to jungle. Just missing the monkeys. All the things worth doing are things you must do over and over again. Love, forgiveness, Reiki. You don't do it once and bang done. It's the repetition that makes a life worth living. Last night the ones out back had a backyard bonfire and huge fight. Windows open to chill spring air I could hear them yelling, swearing, and accusing each other of infidelity. Their house is for sale. They've been cleaning up and clearing out. The neighbors across the street in front are ill and elderly. Their children stop by several times a day to care for them: yard work, groceries, etc. The couple takes turns in the hospital; he's there now. The lady to the side has a new van. She works nights and walks with a cane. They tore down a house, down the street. I never noticed the work, but noticed it's gone now, just grass. Remember how bad it used to be? How you felt like the weird one: the dork, unpopular, ugly, stupid. Those teen years: high school. A morning radio show, question of the day: What made you the weird one in high school? So many calls. All these average, self-deprecating, ironic, insightful, now fine people shared their traumas. "I wore thick glasses." "My mom made me wear purple pants." "I had a horrible haircut." "My dad was a pathologist." "I was short, tall, lonely, poor, glasses, weird clothes, weird haircut..." on and on. Everyone had a story. I listened and thought: Well, that's not so bad. Glasses? You suffered from glasses? Now I was weird. I was shy and read thick books at recess: War and Peace, Anna Karenina, the complete collection of Sherlock Holmes. Sometimes I read during class too, and got into trouble. I wore odd hand-me-down clothes. That's suffering. I listened to the people on the radio as they told their stories. Their stories sounded like nothing, just amusing anecdotes, but I remembered how it felt, to be a teen, in high school. It was horrible, excruciating, torturous. I was desperately unhappy then; wanted to run away, escape, die. I suffered. But really, what was so bad? And what would have made it better? Maybe Sherlock Holmes got me through it. He was a loner too. He used his intellect to make order from chaos and tragedy. How nice to sit by the fire at Baker St with Dr. Watson, and have Mrs. Hudson bring tea as we discussed the latest puzzle. And life lessons from Anna Karenina: things not to do. What's better: money, safety, comfort, and boredom or wild crazy love which ruins you both in the end? I escaped into books, somehow survived, discovered the good bits, life got better. Still a dork, still escape into books; but now fine. She was built like a teapot, with delicate wrists and ankles. "I'll just have another," she announced, snagging a pastry from the top of the pile. "I don't usually treat myself." Sitting under an enormous blooming crabapple tree. So many blossoms, so sweetly fragrant. Loaded with buzzing bumblebees. "Where is the line between Reiki and Christianity?" a student asked me today. It was the first meeting of our 8-week summer Reiki class. "The line?" I responded, "There is no line." I think we both felt confused. "Use your religious faith when you practice Reiki. Access your faith, use it. One can believe in any religion and still practice Reiki. Reiki is not a religion, it's a spiritual practice. We accept people of all faiths, or no faith. You can be Reiki, share Reiki, and pray. Pray to whomever you wish. Just be. There is no line," I continued, hoping this made sense. He's shockingly thin, and tumors bulge. He's too weak to stand. He seems comfortable though, and his eyes are still clear. He drank some water. I shared Reiki with him today. Max, the first time I met him, bit me precisely, neatly, and quickly on my labia. Twice. I was startled, of course, and afraid of him for months. But we made peace and I loved him. After the bites I brought him biscuits, and offered them fearfully into his jaws, his sharp white teeth. He liked to sit on my lap, as much of himself as he could get there, which was about a quarter. One haunch. He liked to be scratched in all the usual places. Today I gently stroked his ears and belly, shared Reiki. Loved him. Said goodbye. He's got two paws on the Rainbow Bridge. Ran into an old friend today. Said she lives in an apartment in town now, but used to live in a camp on Parker Pond. Mornings she'd take her coffee out to listen to - not the birds- she said, the lions. She sat by the pond with coffee and listened to the lions. Said she loved and misses those mornings. Julie Miner's lions, of DEW Haven. Smelling a job well done: clean laundry somersaulting in the dryer. Feeling sun on my face. Feeling cold breeze on my bare feet. Seeing orange: sunlight through my eyelids. The last of the chocolate Easter eggs. Discovering and enjoying her poetry. Sage smoke, stones, and sound. Mushroom risotto and fresh asparagus. It was healing circle day. I met friends in a home full of beautiful stones, located on the high bank of a small stream. We had lunch and then took turns on the table. I saw T as a river goddess, smooth grey mud and rippling water. D got a bilateral stereo shoulder massage and a vibrating tuning fork on her forehead; she said she saw pineal calcifications shatter and fall away. During my time on the table I felt comforted by memories of my ancestors. Then we did Tarot and all the cards were good ones. Heard a story on the radio* about bedbugs. So of course I worried about an infestation. Just like back in nursing school, when we all thought we had every disease we studied. I learned a lot about bedbugs. They get excited when they detect your breath, or the warmth of your skin. They can adjust their feeding schedules to your sleep schedules. They can walk from your apartment to mine: across the hall or through the walls, entering in tiny cracks. They poop, and their poop can look like black mold (Borel, 2015). So of course I went on a search. I looked online for photos and more information. I pulled back the sheets and inspected my mattress. Got down on the floor and peered at the baseboards. I cleaned and investigated. No critters. Nothing that looked like black mold. Nothing. Just like nursing school. Guess I'm going to live another day. Another meeting today about our new program: Reiki at the infusion center. That's a place where people walk in and relax in a recliner while a nurse administers an intravenous medication. We're hoping to share Reiki with the clients and staff there. We have policies and procedures, we have administrative approval and a fabulous Reiki practitioner who's ready to start. Next step is an educational presentation for the staff. It takes a long time to start a new program; but it's good to do it thoughtfully, carefully, mindfully, and respectfully. 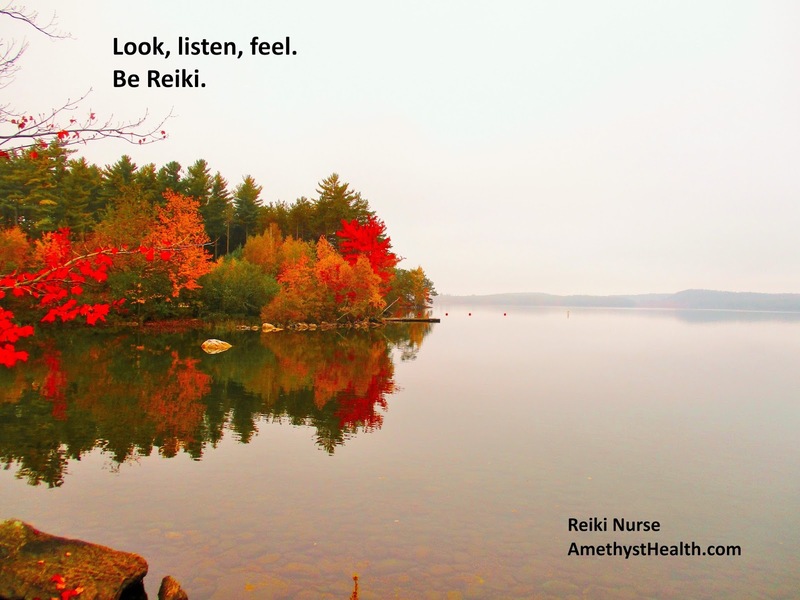 Soon, hopefully, clients can have Reiki with their chemotherapy or antibiotic medication. Saw a lot of pagans circling around grocery store parking lots today. "Maybe it will open in half an hour." "Drive up to the door and look at the sign." "Try that other store down the street." I finally found an open market and got some coffee beans and cremini mushrooms and a pint of potato leek soup. A cold and windy winter. Now spring is late, 3 weeks late. Snowflakes swirled as I drove down to see my grandson and his parents. His mom filled plastic eggs with small pieces of tangerine, metal cars, and chocolate kisses. He crawled around and opened the eggs. His dad made us tiny breakfast sandwiches: miniature bagels stuffed with pepper and onion omelets; topped with pickled onion, greens, and spicy mustard. Snow is predicted all week; daffodils are budding along the south wall. A long winter, but love and flowers renew my heart. Full moon, lunar eclipse or two, and planetary alignments are influencing change and release. This is a time to let go of situations that no longer serve you. Release anger and pain in healthy ways that don't harm or demean others. Do some yoga. Be Reiki, share Reiki. Meditate... shhhh.... listen. This is the perfect time to ask questions and receive answers. Now do what feels right. This is a good time to make healthy changes. This is a time of opportunity. Shift a little or make a leap. Fill out that job application, talk to that person, go to that job interview, sign up for that class, make plans for that trip. Spend time with dear family and friends; people who hear, nourish, and support you.